Your partner in precision urethane-based technology from prototype to production. Despite having a similar name and process as injection molding, Reaction Injection Molding RIM process has capabilities of producing a wide range of physical properties through a two-part liquid system. Unlike Injection Molding, RIM is utilized in combination with thermoset polyurethanes, and never with thermoplastics - making RIM a desired process to produce stronger, lightweight, tailored products and components. RIM combines the superior materials mostly used in cast molding with the adaptability of injection molding techniques. 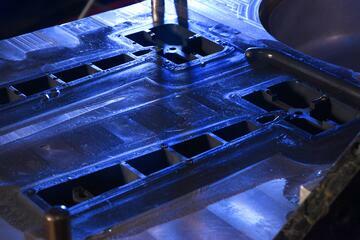 For more information about injection molding and how it differs from cast molding, click here. Products created from RIM are typically more economical than other molding methods, especially for larger parts. In general, RIM uses less energy and equipment to make the same product when compared to thermoplastics. RIM is most often used for manufacturing intricate geometries or unique surface finises in a more cost-efficient way than injection molding. With this process, product designers have the freedom to design what they envision, without compromise! An informative site where you can learn all about product design using polyurethanes. We even answer the questions that Google can't!